Are Sealed-in Laptop Batteries a Good Idea? Given the goodness of Apple's new 13" MacBook Pro, I'm not at all surprised by Fortune columnist and Apple-watcher Philip Elmer-DeWitt's report that the small Pro been one of Amazon's top 100 bestsellers for 20 days, and Apple has clawed its way back to the top of Amazon's bestseller lists, pulling ahead of the cheapo PC netbooks. As of Monday morning, the 13" aluminum job was the site's No. 4 best-selling computer overall and No. 1 in the laptop category, with three of the top 10 and five of the top 20 best-selling laptops on Amazon.com now MacBooks. Register Hardware's Chris Mellor reports that Apple's new firmware 1.7 upgrade (below), which restores the 3 Gb/s SATA speed to MacBook Pros, has also caused some "unauthorised" hard drives to fail, with an Apple Discussion board thread logging multiple comments about the issue, which may occur when the Apple-shipped drive in the MacBook Pro is replaced with a third-party drive and the fast SATA firmware upgrade is applied. Some users report their SATA II drives work fine after the update. Others say they are having problems with stock Apple drives. One poster reverted to a 1.5 Gb/s SATA drive and the problem went away. The Firmware 1.7 release contains the disclaimer: "While this update allows drives to use transfer rates greater than 1.5 Gb/s, Apple has not qualified or offered these drives for Mac notebooks and their use is unsupported." Hardmac's Linathael and Lionel report that while Apple's EFI Firmware 1.7 update has been a relief for many new MacBook Pro owners, it seems to created new issues for some users who are experiencing problems after applying the update, including random freezes and delayed hard drive access, but one user reports that everything is working fine when running Boot Camp. "At first blush, the idea of a non-removable battery in a laptop seems ill advised. After all, batteries are absolutely key to laptops, and everyone has had a laptop with a battery that just won't hold a charge, requiring you to be no more than five feet from an outlet. In those cases, it's simple to buy a new battery and install it in a few seconds . . . There's also the case of those who work in remote locations - such as war zones - where wired power may not be readily available. In extreme cases, the ability to swap batteries there can mean life and death . . . Given the potential problems, why would vendors seal in batteries?" Link: Are Sealed-in Laptop Batteries a Good Idea? WSJ's Walter S. Mossberg, who always has interesting things to say about Mac hardware, comments that removable batteries used in most laptop computers allow you to carry and pop in a fresh spare when your battery runs out of juice between charges, and to easily replace a battery when its lifespan is over. However Mossberg notes that the "dirty little secret" about removable-battery laptops owned by average consumers is that hardly anyone buys extra batteries - research firm NPD estimates fewer than 5% do - which has provided Apple with a rationale for equipping its new MacBook Pro laptops with higher-capacity, sealed-in batteries in computers with the same size and weight as their predecessors, but with 33% and 46% greater charge capacity. Macworld's Roman Loyola has posted a video tutorial on taking advantage of the Secure Digital (SD) memory card reader support in the new 13" and 15" MacBook Pros to create an SD Card startup disk. In this video, Loyola shows how to create an SD Card startup disk for the 13- and 15-inch MacBook Pros using an SD Card with a capacity of at least 8 GB and the OS installation disc that came with the laptop. "I've been tinkering with a little project for a while now. I have a two and a half year old MacBook Pro that I've been slowly adding new parts to in an attempt to breathe new life into it. I started by upping the RAM from 2 GB to 4 GB a while ago. I then proceeded to replace the hard drive with a 500 GB model, replacing the 160 that was in it. Along the way my motherboard failed due to the infamous Nvidia graphics failure, but the upside to this was a brand new motherboard courtesy of Apple. Finally, I have replaced the rapidly failing battery. I would normally have just bought a new laptop, but there was nothing really wrong with this one, bar the above...."
Link: Another Day, Another HackBook - Leopard on a 9-inch Dell Netbook? "A SanDisk investment commentator, blogging as Savolainen, reckons Apple is going to introduce a tablet or netbook-type Mac. Yes, you've heard this before. But this time, the evidence lies with the SD Card adoption by MacBook Pros." O'Reilly Radar's Mark Sigal notes he's written several times before about what he contends will be Apple's inevitable assault on the Tablet market, but that he hadn't factored until recently is how symbiotic such a device would be for Baby Boomers, who, now aged 53-73, constitute a whopping 70M+ demographic cohort in the US. "Take this one to the bank: the Hardware Matrix is coming. 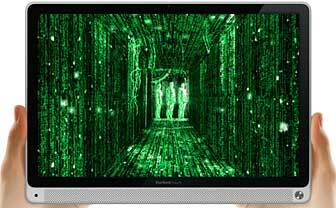 "What is the Matrix? Envision a world where the Mac, Apple TV, iPhone, iPod touch, Boomer Tablet and iPhone Nano (rumored), respectively, all leverage a common SDK, plug into the App Store and integrate with Mobile Me (in addition to iTunes), and you understand that this implies all sorts of hardware abstraction decisions." "The current X18-M and X25-M solid state drives (SSDs) use a 50nm process and have 80 GB and 160 GB capacities . . . Intel will move to a smaller 34nm process and double the capacities with the 1.8-inch form factor X18-M and 2.5-inch form factor X25-M (M meaning Mainstream) moving to 160 GB and 320 GB capacities...."
Improves sensing and accuracy of the MagSafe Power Adapter. This SMC firmware update adds compatibility for the latest service replacement batteries. To complete the firmware update process, please follow the instructions in the updater application (/Application/Utilities/MacBook Air SMC Firmware Update.app). The updater will launch automatically when the installer closes. "One of the most exciting moments in any nerd's life is getting a new computer. For Mac nerds, being as passionate as we are, that moment is doubly exciting. Today it was my turn as my new MacBook Pro 13" turned up. "I haven't used this anywhere near long enough yet to be able to make any definitive conclusions. But . . . I am loving it!" "The users spoke. Apple listened. Back in October 2008, the Cupertino-based computing giant released a 13-inch MacBook featuring its unibody enclosure, carved from a single piece of aluminium for lightness and strength. But for some reason, they dropped the FireWire port. The Apple community was up in arms. With FireWire having been included in almost every Apple Mac for over a decade, many - perhaps most - Mac users had at least one peripheral which used FireWire, and were dismayed to find it missing on the new MacBook. Less than a year later, in the summer of 2009, Apple upgraded its entire range. The aluminium 13-inch MacBook joined the Pro range, and the FireWire port returned, alongside a brand-new built-in SD card reader. Hurrah! "But the new 13-inch MacBook Pro offers far more than new and returning expansion ports. It boasts improvements across the board, as well as a significant price drop . . . There really isn't much to complain about here. Given the . . . across-the-board improvements and the drop in price, there's never been a better time to buy a MacBook." "A week before the annual WWDC, I sprung for a 2.4 GHz MacBook with 4 GB RAM and a 250 GB hard drive. I liked the form factor, and I've been using a Logitech G11 Illuminated keyboard for several years, so I knew the benefits that a lit keyboard brings to the table. "The latest TV ads may tell you that Windows notebooks run on the same processors and can get the job done in the same way, and they can be had for $400 less than $1199 list on the 13-inch MacBook Pro. Well, I must say that those commercials are sort of bunk in that they don't tell you the differences in operating systems and the difference in how memory is used...."
Dean reports that Apple claims fewer than 1% of MacBook Pro users actually used the ExpressCard slot in previous models, and it's possible to boot the machine from an SD Card, which will be handy for on-the-road troubleshooting. Macworld's Jason Snell notes that the MacBook Air is a product that "lives on the margins", being the slowest laptop and, indeed, the slowest computer in Apple's current stable, leaving out many features that are standard on other Mac laptops (including multiple USB ports, FireWire, ethernet, and optical drive), and Macworld Labs has also found the latest top-of-the-line Air to actually be slower than its predecessor in many tests. In short, says Snell, the MacBook Air is an odd duck. DigiTimes' Monica Chen, Yen-Shyang Hwang, and Joseph Tsai report that Asustek Computer has reduce retail prices of its 7-inch and 8.9-inch Eee PCs in an attempt to clear inventory, lowering wholesale prices per unit to as little as $153. PR: QuickerTek, a specialist in power and wireless Apple products, has just announced a new wireless Internet and networking USB device that triples the wireless range. This new Quicky Jr. II is compatible with the Apple AirPort Extreme Base Station as well as almost every other 2.4 GHz wireless equipment users are likely to run into while traveling. Quicky Jr. II is priced at $89.95 at QuickerTek dealers. 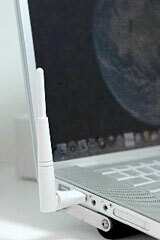 Quicky Jr. II simply plugs into the USB port of any Mac laptop running Mac OS X 10.4 or later. The single driver makes it all work; there are no extra steps to immediate wireless satisfaction. Whether using a coffee shop network or tapping into the network in the office, Quicky Jr. II provides increased range while maintaining speed. Not only is Quicky Jr. II easy to use, it also weighs only half an ounce, so it's perfect for the Mac user on the go. It fits in your shirt pocket and no external power is needed, so there's no power brick to lug around. And like all good Mac products, it's styled to look right with any Apple laptop such as PowerBooks, MacBooks, MacBook Pros or iBooks. Quicky Jr. II is fully compatible with all devices rated for 802.11n, 802.11b, and 802.11g networking in addition to the Apple AirPort Extreme Base Stations. That means users can get up to 15 megabit per second transfer rates at the office, school, airport, or any available wireless network. Quicky Jr. II also keeps your Internet and network transfers safe with 64/128 bit WEP/WPA encryption. QuickerTek innovated the Quicky USB wireless booster design years ago, and this version is a smaller, lighter, and more affordable version - so any Apple laptop user can expand their wireless performance. Like most QuickerTek products, the new Quicky Jr. II is backed with a one-year warranty on parts and labor. QuickerTek has been a recognized leading innovator of antennas and RF products for Apple Power Macintosh, Mac Pro, iMac PPC and Intel, PowerBook, MacBook and MacBook Pro computers. QuickerTek products can be purchased online at quickertek.com and from authorized dealers. PR: EDGE Tech , a US-based supplier of DRAM and flash memory upgrades, portable computing products, storage devices, and other experience-enhancing technology solutions, has launched a variety of products including two new flash drives to its established DiskGO line - one with increased capacities, and the other with a sleek, new design - as well as two DiskGO portable hard drives with backup software. EDGE's mega high-capacity 128 GB DiskGO Flash Drive stores approximately 85,000 photos, 128 hours of video, 32,000 MP3s, or 1,280,000 documents. The drive is housed in a rugged aluminum casing that provides protection against wear and tear. It includes CryptArchiver Lite encryption software, a trial version of CryptArchiver which allows users to encrypt up to 25 MB of data using 128-bit AES encryption. The full version of CryptArchiver, available at www.edgetechcorp.com/support, encrypts up to 32 GB of data. Exceeding the US government standard for encryption strength, this robust version allows users to choose which cipher method they prefer: 256-bit AES or 448-bit Blowfish encryption. 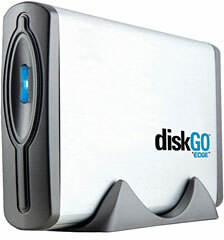 Supported by a lifetime warranty and toll-free technical assistance, the 128 GB DiskGO Flash Drive is USB powered, and plug and play; there is no need to restart your computer to begin use. EDGE's portable 2.5" and 3.5" hard drives allow users to easily transfer, save, and carry documents, photos, music, and videos while protecting data from accidental loss. Both hard drives include Dmailer Backup software, which empowers users to store, sync, and back up files locally to the device. Users can choose to encrypt data up to 128-bit AES, as well as schedule backups at specific times or update automatically, creating peace of mind and ease for the user. In addition, redundant backup copies can be saved online to a personal "cloud" - an Internet service location to store information other than your computer. Users can download and share files from their private "cloud" with any computer connected to the Internet. The 2.5" portable hard drive contains a unique, built-in USB cord, meaning no extra cord or power supply is necessary. Both hard drives are Windows 2000+ and Mac OS X 10.5+ compatible and are backed by a three-year warranty. EDGE is launching a new generation of flash drives to its DiskGO line. The new DiskGO series is smaller - measuring 1.5" by 0.9" - and features a shapely contour. Its small and unique design goes anywhere, and fits easily into inconveniently placed USB ports. This one-piece flash drive employs a sliding apparatus on its back to expose the USB interface that connects to the computer. 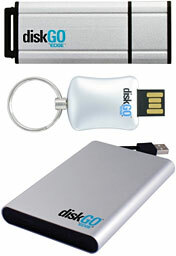 EDGE is also offering the new generation of DiskGO flash drives with Dmailer Backup software. All DiskGO Flash Drives are offered with a lifetime warranty. EDGE Tech president and CEO, Jeff Thompson, said, "These innovative product additions continue to push the envelope for storage options, density, and aesthetics." With $2,500 saved from his newspaper route, 14-year-old Jeff Thompson founded EDGE Tech in 1986. EDGE Tech , an ISO 9001:2000-certified company, is a leading supplier of DRAM and flash memory upgrades, portable computing products, storage devices, and other experience-enhancing technology solutions. EDGE products are available through leading US resellers including CDW, Insight, PC Connection, PC Mall, Tech Depot (an Office Depot Company), Zones, Walmart.com, and Staples.com, and through distribution at D&H Distributing, Ingram Micro, and Synnex Corporation. EDGE products are also available through its website. PR: Other World Computing (OWC) announced OWC DDR2 800 MHz Memory Upgrades are now available up to 6 GB for the 2009 White MacBook 13" model. OWC Memory Upgrades offer White MacBook users the advantages of three upgrade options not available from the factory and a cost savings up to 45% on the same size 4 GB upgrade, plus a lifetime advance replacement warranty and money back guarantee. Add to existing 1 GB factory chip for 3 GB total memory. Available from OWC only - Not offered by factory. 40% lower cost than factory installed 4 GB upgrade. Add to existing 1 GB factory chip for 5 GB total memory. Available from OWC only - Not offered by factory. Available from OWC only - Not offered by factory. Additional money savings are available for customers who take advantage of OWC's memory trade-in rebate program, which offers $5 Cash Back per 1 GB Apple Factory Standard memory module. With the rebate, OWC's 4 GB Memory Kit for the May 2009 White MacBook 13" is a full 45% lower cost than the same size factory installed upgrade. OWC Memory Upgrades are also available immediately for existing Core 2 Duo MacBook and MacBook Pro models in both kits and modules up to 8 GB starting at $32.99. OWC also offers White MacBook 13" owners internal 5400 RPM hard drive upgrade options at savings up to 50.5% compared to same size factory installed options as well as faster and higher capacity upgrades not offered by the factory. OWC hard drive upgrade prices start at $73.99 for a 320 GB 5400 RPM drive while a 500 GB 7200 RPM upgrade priced at $149.99 is available for the ultimate White MacBook performance storage configuration. White MacBook owners selecting an OWC internal hard drive upgrade can either send the factory stock 160 GB hard drive to OWC for a cash back rebate of $17.50 or keep the factory drive and install it into an OWC Mercury On-The-Go Pro FireWire/USB 2.0 or Mercury Express USB 2.0 enclosure for additional external storage capacity. OWC memory upgrades are available from 16 MB up to 32 GB for nearly every current and past Apple notebook and desktop computer manufactured during the past twenty years, including Mac Pro Xeon, iMac, PowerMac, Xserve, iBook, and PowerBook computers. By maintaining an active state-of-the-art test lab, OWC can ensure its memory upgrades offer the highest product quality and reliability and backs them with a Lifetime Advance Replacement Warranty and Money Back Guarantee. OWC's independent memory benchmarks testing on a wide variety of Mac computers consistently demonstrates having more memory provides higher real-world performance. OWC memory performance gains are even more apparent when using memory intensive applications, such as audio/video, photo, 3D modeling, gaming and other applications, where OWC memory upgrades offer the best performance for the investment. The full OWC Memory line, as well as a compatibility guide which directs customers to the correct upgrades for each specific Apple model, can be found online. PR: The Logitech Kinetik 15.4 Briefcase protects your notebook with a lightweight exo-shell casing and padded sleeve. 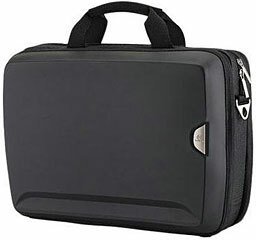 Expanding compartments provide easy access to your notebook and other assets. Additional cargo bays and convenience pockets supply structured storage for the rest of your valuables. Lightweight exo-shell casing: Protects your notebook and other valuables without added bulk. Padded notebook sleeve: Secures and protects your notebook. Expanding compartments: Enjoy easy access to your notebook and other assets. Structured storage: Additional cargo bays and convenience pockets secure and organize your valuables. Freestanding: Superbly balanced, your briefcase won't fall over when set down. Cushioned back panel: Adds support when carried against body. Trolley sleeve: Attaches instantly for effortless transport. Professional look: Strikes the perfect balance between style and function. Streamlined profile is at home in the boardroom or on holiday. Superior construction: Fabricated with precision detail from ballistic nylon, polyurethane/ethylene vinyl acetate (EVA) composite, and polyester. Factory refurbished units with Apple's full one-year warranty.